We had a reader who noted Doug's recent decision to never sail a Radial again after getting chicked at the Laser Master Worlds in Oman and asked if Doug would elaborate on the reasons for his decision. Short answer (and I suspect the real answer) is that women don't sail full rigs at the Worlds so he'll never get chicked again. Long answer is more complicated but was also decided by the experience in Oman. Lots of people have written about the recommended weights for the various rig sizes and there are differing opinions. Even Performance Sailcraft Australia and Laser Performance have differing recommendations on their websites. Doug and I sail at opposite ends of the experience spectrum. He wants to win at the highest level and I just want to use the Laser as a training tool for other boats and to stay fit. Even though we sail at different levels and for different reasons, we often make the same decision for the same reason. From the below average to the highly experienced sailor, regardless of weight, the decision will always come down to the constant: what people in your fleet are sailing vs. the variable: what you can handle comfortably. And what you can handle comfortably will vary depending on the weather at the venues where you sail. There aren't many (usually any) masters aged women in my district that sail a Laser. Being a light sailor, I should be in a Radial or even a 4.7 but when I do sail a Laser it is almost always in a full rig simply because I would rather start with and compete against people my own age rather than kids (they rarely mix the fleets in our district). I have a better shot at beating a master sailor in a full rig than a kid in a Radial or 4.7. If the wind is light, I have a really good shot at beating a few guys my own age but if the wind is heavy I only have a slim shot at not being blown off the course. In reality, I sail a full rig in light to medium winds and then become a spectator in heavier winds. I could certainly switch to a Radial in heavier winds but that puts me with the kids and I'm not fit enough to go head to head with a kid in wind and certainly don't want to be reminded that I'm no longer a kid. 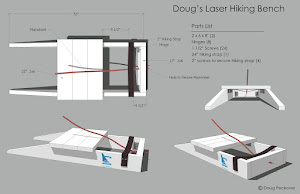 So my experience in a Laser in heavy winds is usually double handed with Doug, which is kind of cool because if I'm tired, he hikes while I drive, and I get one on one coaching and it's a blast. So, bottom line, whatever rig is best for you will likely get trumped by whatever rig the bulk of the fleet is sailing. If you are fortunate enough to have good fleets for both rigs, then go for the rig that is the most fun (you'll stay with the sport longer). Doug has what I would call a very intimate relationship with the full rig but the Radial is an absolute stranger. 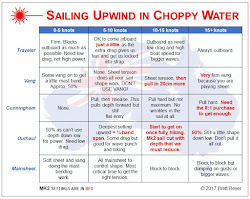 He has sailed a full rig thousands of times in just about every condition possible and he knows what subtle boat handling changes to make as the conditions change. He takes advantage of changes that last only seconds and might only move him a few seconds ahead but those add up at the finish line. When it comes to the Radial, he can't feel the boat at all. The subtle things that work in the full rig just don't work in the Radial. At the Brisbane Master Worlds, he was a half a leg ahead in the Radial fleet at one point and still pulling away. He couldn't repeat that again if he tried because he didn't know what he was doing and why it was working. I had already challenged him on whether he really knew how to sail a Radial since he didn't sail it regularly. There may or may not be a variety of subtle changes that he can make in the Radial that add up at the finish line but without much experience, he's just a very good sailor in a rig he doesn't know. He'll do well but probably won't beat someone with more experience in that rig. In Oman, he watched Vanessa (who constantly smiled back at him) and he matched what he saw her doing and she just kept smiling back at him and going faster. In Part 2, we'll hear Doug's reasons for changing to a Radial and back to a full rig … so that he'll never get chicked at a Worlds again. OK let's get scientific about this and only compare equivalent events so that as far as possible we are comparing results in fleets of the same standard, i.e. analyze only the Masters Worlds and ignore the others. 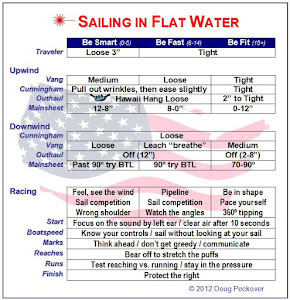 And the other way to look at what you said in the long penultimate paragraph is that Doug has more room to improve his Radial sailing than his Standard Rig sailing. So there's more upside for him if he sticks with a Radial in future Masters Worlds. You have a point but I think the answer is actually somewhere between the two. Al Clark won the Radial Master Worlds in 2011 and then won the Standard Master Worlds in 2013. If Doug would actually spend some time getting a better feel for the Radial then he could sail the rig best suited to the venue and increase his odds likely bringing his average up in both the full rig and Radial. But, the biggest factor is will he sail a Radial at local events and get a feel for the boat? I'd put the odds at zero percent. He looks at who is going to show up at various events and just can't help himself, he has to go head to head with them. If we had a big local Radial fleet, he'd switch in a heartbeat. But, I also think he's been with the full rig for too long ... it's "his" boat. He would probably have an easier time finding another gear in the full rig at a light weight than he would finding all the gears on the Radial, which may or may not be there. I once had an Olympic coach tell me the Radial was horribly balanced and a dog of a boat to sail. What if he's right? Whatever he does, he's screwed. If he stays in the Radial at Masters Worlds he's going to get chicked in the GM fleet. And then in a couple of years when he's a GGM, if he sticks with the full rig he's going to get Marked. Yes, I think he decided being Marked was the better option. Ah, but I see Mark got Douged in Chile, so there's hope for him yet. But 76kg and over is always Standard rig in my book, thought height is also a major consideration. On open water I sail a Radial rig at 74kg. Several years ago a leading team USA olympic coach informed me that at 5'8" I would need to weigh ~90kg to have sufficient righting moment for a Standard rig on open water, which was the point at which I switched to the Radial rig 9 years ago, and a good choice it was. At most major events in the UK at least there are usually twice as many Radials as Standards, sometimes more, with a very high standard of competition. Robert Scheidt apparently got down to 175 pounds (79kg) for Oman but he's tall and looks even taller when sailing. In fact, most of the sailors in the gold fleet were tall and skinny. So height should be taken into consideration but is rarely mentioned. It makes you really appreciate how Michael Blackburn (who is short) beat Tom Slingsby (who is not) to win the 2006 Worlds in Jeju South Korea when it was really windy.